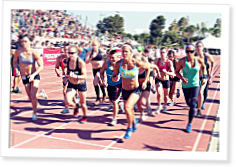 From July 16-18, 2010, the world’s fittest women competed under a blazing sun at the Home Depot Center in Carson, Calif. For three days, elite athletes put their training to the test in a new sport—the sport of fitness. The CrossFit Games challenged the human mind, body and spirit, and anyone who competed accomplished a monumental task in qualifying for the Games and putting themselves through our sport’s ultimate test. Their desire to be stronger and faster drives CrossFit to new heights and ultimately helps define elite fitness. What follows is a tribute to the 2010 female competitors who gave their all and left nothing in the tank. Their pain was temporary. Their images were not. The CrossFit women at the games blew me away! I mean that. I have rarely been as impressed as I was with their performances. Word. She's unbelievable and deserved at LEAST one photo to herself. "The Men" photo PDF doesn't have any pictures of Graham H.
While I agree about Kristen and Graham being somewhat MIA, I'm sure they will get a ton of coverage in the remainder of this "crossfit year." It'll be like reality TV w/a classy audience. I agree. IMO these pictures are not about showcasing the champions, just some of the awesome images from the games. Great shots! They give me inspiration for sure!